Starting January 7th, Zoya is offering 3 bottles of polish FREE. 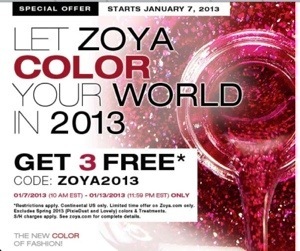 Use promo code ZOYA2013Just pay a $10 shipping and handling fee. Right now they are offering their Dream Box with free shipping. It is a nice velvet like lined box with 3 bottles of polish inside. You can order an empty box and chooses your own colors. If you use their Share the Love link, you will have points added to your account. I believe it’s enough points for a free bottle of polish, or you can use it for shipping, remover, and other things. If you have not set up an account click on this Share the Love for those points. I know I’ll be taking advantage of this offer. My Wish List with Zoya is getting longer and longer! Let me know if you get anything from this sale. This is Drew by Zoya. This is my favorite son, so of course I had to buy this polish from Zoya. I was happy with the color, because no matter what color I was going to buy it. If they had one named Jilly I would buy that one as well. Zoya is still giving away a free bottle of polish!. If you do not already have an account with Zoya, click on the link below, create an account and they will put in your account a coupon for a free bottle of polish. On the Zoya website, they have a note saying if you add 2 more bottles to your free bottle coupon you will get free shipping. So that is good. When I redeemed my points, they didn’t have this, so I had to pay $6.95 for shipping. I have since learned to check their Facebook page because they seem to offer ‘free shipping’ deals all the time. My last order was free shipping, I haven’t received it yet. Right now they have a Mother’s Day Trio with free shipping. Let me know what color you get! 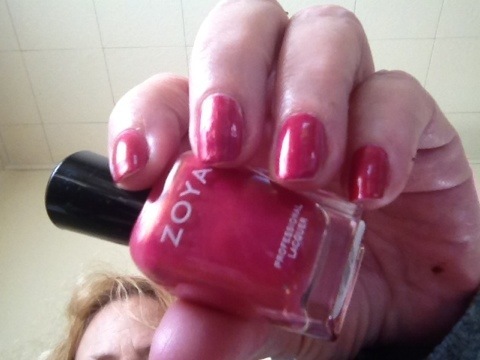 Zoya ~ Share the Love FREE Bottle of Polish! No Kidding! Zoya has just upped their Share the Love program. By clicking this link, instead of getting a $5 coupon, which was awesome, now you will get a FREE bottle of polish. Click on the above link for your free bottle of polish. The Zoya website says this is for the month of April, but I have seen where some of the colors have sold out, so don’t wait too long. Let me know what color you get. I’m so excited they changed this to a free bottle. They also have promos for free shipping, so click the link and check out their website!